Your resume has only six seconds to make or break your career. That span of time allows a recruiter to scan vital resume parts. Likewise, choosing the exact data to insert plays a vital role in firming your resume. Tailoring your resume for each country is a plus point. Therefore, if you’re aiming to write a winning resume, strive hard to put the right data. However, tricks such as this spoil your chance. Otherwise, remove petty stuff and follow effective resume guidelines. You’ll find resume writing guidelines in this article that will help you pin the important parts of a resume. Hence, create an updated resume checklist using these resume guidelines. Your resume must have a clear professional profile, so when a potential employer scans your resume your desired position must already be obvious at first glance. Explain your profession further to pass the six-second test. This data is a vital part of a professional resume, yet many job seekers forget to include this in their copy. Add your contact info such as phone number, email address, and social media accounts to make you accessible to your potential employer. Make it easy for him or her to contact you for an interview. Your job objective must be direct and must deliver your resume’s purpose. This section is one of the critical parts of a resume because it helps you connect to hiring managers or employers. The education section need not include your primary and secondary education data. In contrast, a professional resume needs your graduate school and degrees. A few countries may require detailed data, so tailor your resume according to your prospective employer’s location. This part summarizes your career details, so be careful how you write this section. Make it interesting to read and keep it short. You wouldn’t want a recruiter to throw your resume away because it’s tiring to read. Exclude your past jobs if you want to write a pro resume. In fact, what matters to recruiters are your most recent jobs because they want to learn more about your skills and duties then. Just like your volunteer work or hobbies, skills are optional in a resume. However, focusing on them doesn’t mean you must list each one. It works best if you tailor the skills aligned to your intended job. In the same way, you can choose the ones to highlight in your resume by using the job description. Remember to use keywords because this trick is effective in making your resume stand from the rest. Get keywords from the job post but avoid copying. Tweak it, yet retain the keywords and phrases from the job ad. This practice shapes the resume-scanning tactics of most recruiters. When you use action verbs in your resume, they make it vivid and direct. Action words are rather more solid than adjectives. They highlight your accomplishments, thus, selling you to the employer well. Relevant achievements and awards tell employers how you could solve conflicts and complete tasks. A resume is more interesting to read if it has numbers and percentages that show exact results. Recruiters need such info to gauge your skills. Besides this, digits and rates require a small part of your resume yet give the recruiter so many details. 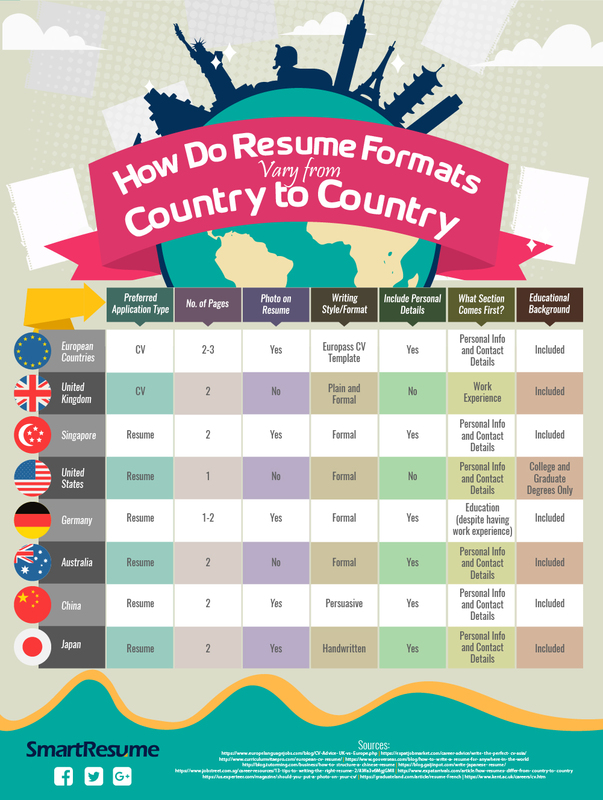 Different countries differ in resume norms. If you’ll work in a foreign country, pay attention to their culture and resume guidelines. To learn more, check this infographic. Avoid placing your personal data such as weight, height, blood type, and others. Further, irrelevant details, such as these, won’t help you land a job. If you want to create a pro resume, you don’t have to put your primary and secondary education. In addition, a few countries don’t ask for an educational background; hence, always check their guidelines. Don’t put unrelated work experience in your resume because this practice will eat up spaces and make your resume boring. Otherwise, it will kill your chances for the job. You need not mention you have a clear police record. Once they hire you, it’s their job to check rather if you have a criminal record. You’re selling yourself, so negative words have no room in your resume. Avoid using terms such as “can’t”, “didn’t” and “don’t”. In particular, focus on the positives and cut out the ones that put you down. Lies are still lies, and they kill your integrity. Likewise, several tricks can help you cover details in your resume. Sometimes, job seekers even mask their shortcomings to increase their hiring chances. However, lying to uplift yourself may not help either. Proofread once you finished writing your resume to avoid spelling and grammar errors. Basic errors may tarnish your image if you wish to show yourself as an expert to a hiring manager. Resume guidelines help you include important parts to your resume. Remember, your future career lies on how your resume sells you well. Impress employers by showing how fit you are for the job with a winning resume. If you still struggle in creating an effective tool, you can hire the services of expert writers. Choose the right resume writing service for your job-hunting needs on this site.